PRICE: For our base rates please see Rates & Reservations for our weekly yoga retreats. PACKAGES: We have four packages available. Try Yoga & Surfing, Yoga & Rejuvenation, Yoga & Adventure, or Pure Yoga. For more details see Anamaya Retreat Packages (ARP’s). WORKSHOPS: There will be a very special Yoga Nidra Workshop available this week. This is one of the most healing and transformative of all yogic practices. The workshop is one hour and costs $35. Please see below for more information. Adam’s interest in yoga was sparked in 2003 by Diane Bruni’s creative energy, fluidity, and grace – her immersive ritual of pulsing breath gave him a physical vocabulary that just instinctively made sense. After having sustained the rigors of 10 years as a dancer and a singer in the performing arts, it became very clear to Adam that it was time to seek out deeper meaning. To heal the body, the sort out the destructive habits of the mind, and find a way to connect and express himself spiritually. It was meditation, chanting, and the philosophy that drew Adam to the Sivananda yoga ashram in the Laurentian mountains in Quebec. This marked the birth of a spiritual journey that helped Adam to discover his bhakti qualities – compassion, love, a connectedness to something bigger, and a real sense of devotion in service. With this foundation set, Adam ventured into the world believing that within each student lies a vast wellspring of love and potential – and it’s his job, as a yoga teacher, to draw that out. Teachers Scott Davis and Pat Harada Linfoot founders of Toronto’s Octopus Garden Yoga centre, continue to motivate and inspire – teaching yoga as a therapeutic tool and as a great community builder. 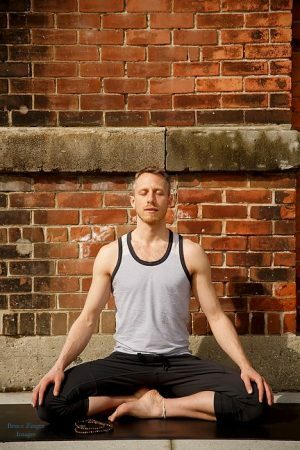 Adam completed his restorative teacher training with Scott in 2011, and led by Pat, completed a training in yoga for mental health at the U of T faculty of social work. Adam is also a trained Thai massage practitioner, and completed courses in TCM at the Shiatsu school of Canada. Other teachers who have significantly made an impact on Adams journey include, Jason Crandell, Elena Brower, Hart Lazer, Rod Stryker, Aadil Palkhivala. Adams integrative and accessible approach challenges students to look beyond the superficial workings of the mind, and move into the intelligence of the body. His foundation and commitment to keeping students safe, helps them to find greater depth, awareness and wellbeing in their practice- and in their lives. Adam has always believed that music and dance has great power to influence positive change in people, and students can expect to laugh, play, and find joy in his classes. 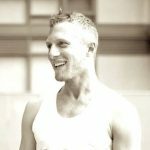 Adam’s goal is to create a space of ease and support for yogis to come together, beginners and experienced practitioners alike. Sharing in our practice invites us to make peace with ourselves and in our lives. Together as an intentional community, we build our capacity to discover an ever deepening sense of well-being. Through posture, movement, and breath we move toward a greater sense of clarity and freedom. The morning sessions will be an opportunity to play with a vigorous strength building and core focused vinyasa practice. A chance to develop intelligent tools to integrate more conscious alignment and proper breathing techniques into a creative, engaging and challenging practice with modifications for all levels. The afternoon sessions will be deep release restorative-based practices. Incorporating elements of therapeutic work, pranayama, and supported postures designed to quiet the mind and inspire the body. A space to awaken the body’s vitality and healing potential while releasing patterns of held stress and tension. Adam’s classes are an opportunity to clear the slate, physically and emotionally to make space for the constant evolution of realizing your highest potential. One of the most healing and transformative of all yogic practices is the ancient practice of yogic nidra. Simply translated as ‘yogic sleep’ – mere relaxation fails to describe the power and the depth that the practice of yoga nidra can take us to. It produces an extraordinary quality of rest capable of re-teaching the body to restore itself to its fullest potential. Reprogram your heart, mind, and body with the ability to settle into the deepest recesses of conscious rest and relaxation. In this soothing and hypnotic session, we’ll use restorative postures and pranayama (breath work) as a way to dissolve surface tension and nervous system agitation, we’ll explore a variety of techniques, from the rotation of consciousness and visualization to train the nervous system to settle into a profoundly rejuvenative and regenerating state of being, and work with elements of mindfulness and metta meditation to steady and stabilize mind and heart states. 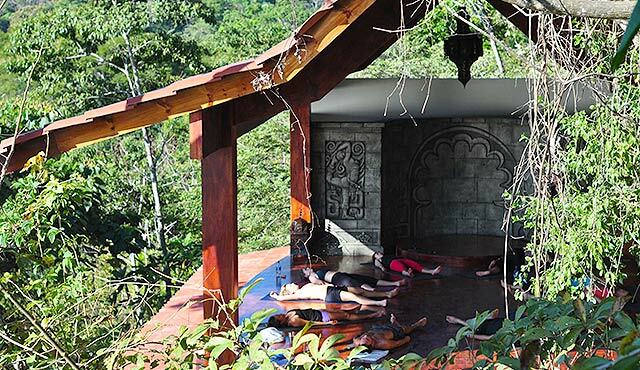 The perfect way to take the relaxation of your yoga retreat to a whole new level. This workshop is one hour and costs $35.